This is a chicken stew with roasted tomatoes, chillies and garlic. It is cooked for an hour in a cast iron pot. I have seasoned the Stew with curry powder and pepper powder. It is served hot with bread. 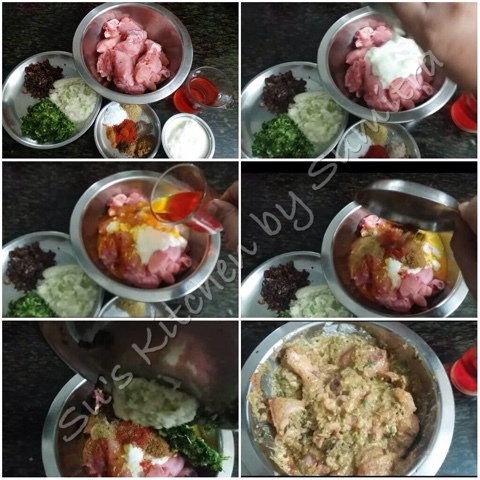 Absolutely comfort food for the winters..
Add salt and 1/2 tsp pepper powder to the chicken and mix it . Keep it aside . Roast the tomatoes , dry chillies and garlic. Add them into a grinder and add little water to make a paste. Keep it aside. Take a cast iron pot . Add the butter. Let it melt. Add the chicken pieces and cook it for 2 minutes. Remove it and keep it aside. In the same butter , add the roasted paste , chicken stock , 6 cups of water, chicken cubes , salt , pepper powder and curry powder.Stir and cook for 2 minutes. Add the chicken pieces, rose mary, sweet potato, carrot, cauliflower, onion and carrot. Stir and let it simmer for 30 minutes. Add the broccoli , peas and mushrooms. Cover the lid and cook for 30 minutes. Once done, open the lid and serve it hot with bread. 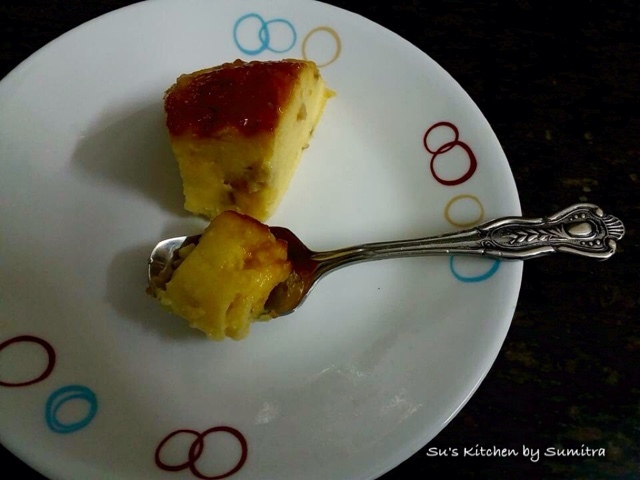 This dessert is made with pure orange juice. 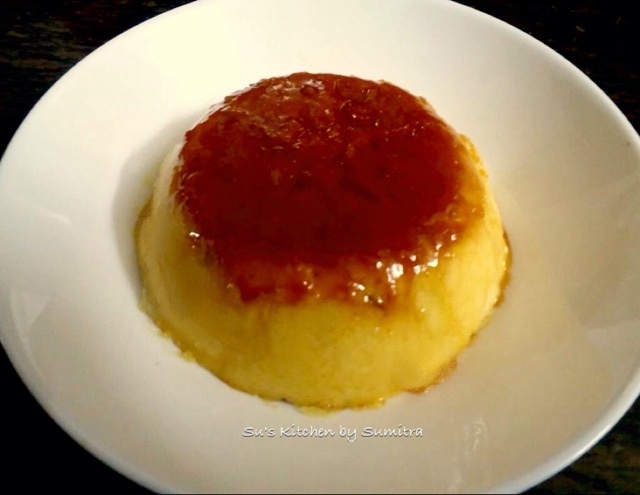 This is my variation of making this eggless pudding.Though eggless.. It taste awesome. Take a baking bowl. Grease the bowl with butter. 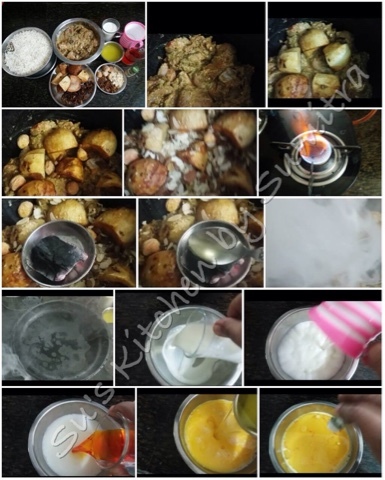 Heat sugar and water in pot and cook on low flame till it is golden brown. Pour this into a greased baking bowl and spread evenly. Keep it aside. Take a pot, add a cup of milk. On a low flame, let the milk simmer. Add sugar, condensed milk and vaniĺla essence. Stir and mix it. Take 1/4 cup milk, mix the custard powder in it. Add the custard milk in the milk. Stir it continuously so that no lumps form. As it thickens, switch off the flame immediately. Keep on stirring till it cools down a bit. 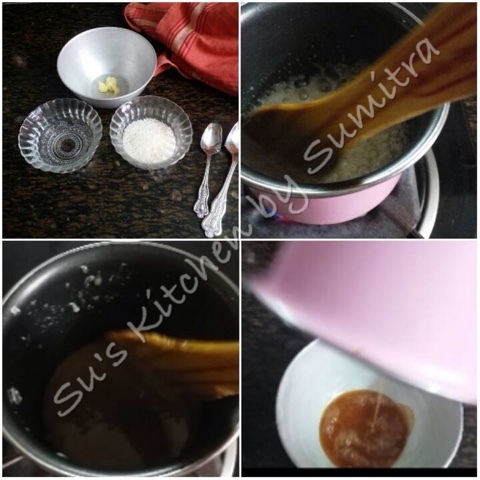 Heat the remaining milk, add the veg gelatine or agar agar powder and mix it and let the powder dissolve in the milk, add this agar agar mixture into the custard milk. Stir it. Let the mixture cool down a bit. Add the orange juice and orange candy peel. Mix it. Pour the mixture in the caramelised bowl. Cover the bowl with a foil. Take a steamer. Add water. Place the tin into the steamer. Cover the steamer. Steam it for 30 minutes. Take the bowl out of the steamer. Let it chilli for an hour or more in the fridge. To unmould it, very light heat the base of the baking bowl. Run a knife around the edges. Turn the pudding on a plate. Serve it. The elegant cutlery I have used is from Awkenox. 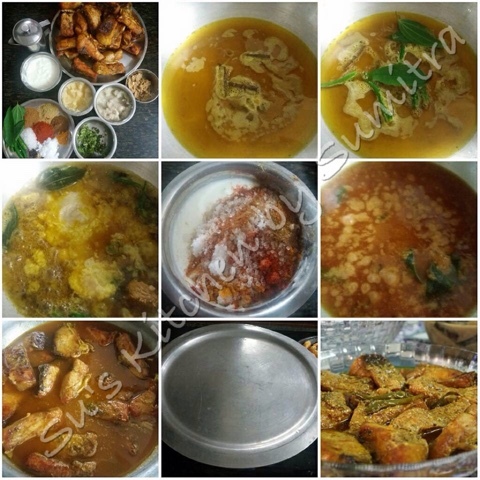 This dish is a popular dish of Bangladesh. 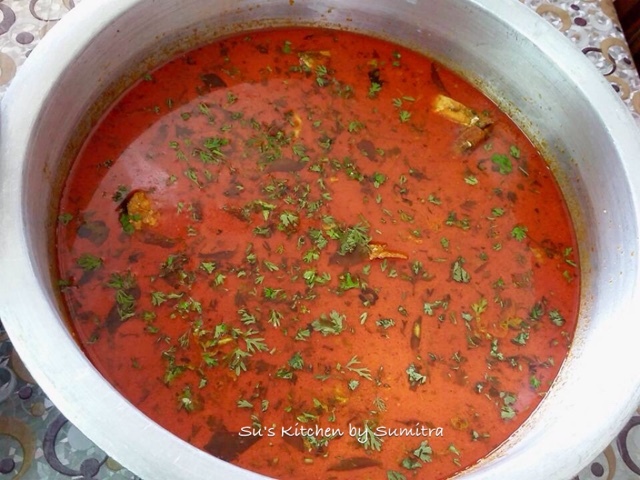 It is a richer variation of Khichudi cooked with Mutton. Khichudi or Khichadi know all over India is normally is cooked with vegetables, rice, dal and spices. 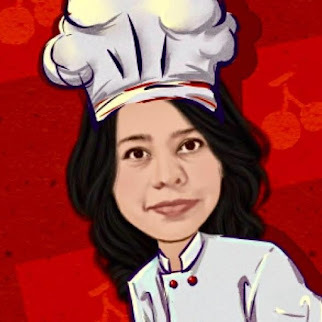 The cooking style varies depending upon the state. 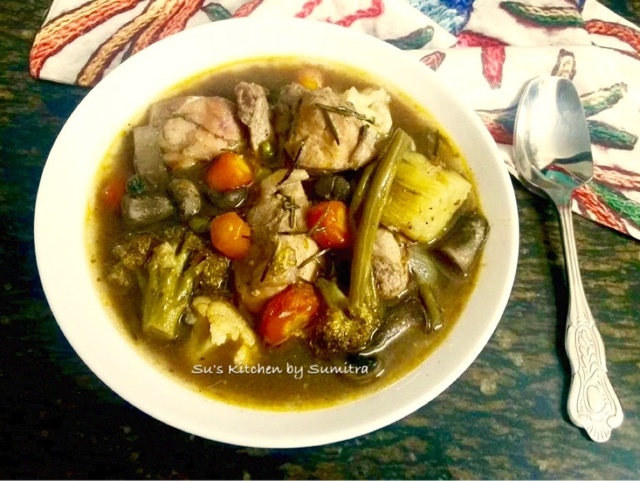 This is a one pot meal... very easy to make. Take a pan, add the rice and dal. Roast it till it is light brown in colour. Wash the rice and dal. Soak it in water and keep it aside. Take a pressure cooker. Add the oil. Heat the oil to a smoking point. Reduce the flame, add the whole garam masala and bay leaves. Let it crackle. Add the green chillies. Let it sauté for few seconds. Add the onion and stir fry till light brown in colour. Add the vegetables except tomato. Stir and cook for 2 minutes. Add the garlic - ginger - chilli paste and sugar. Sauté it for 2 minutes. 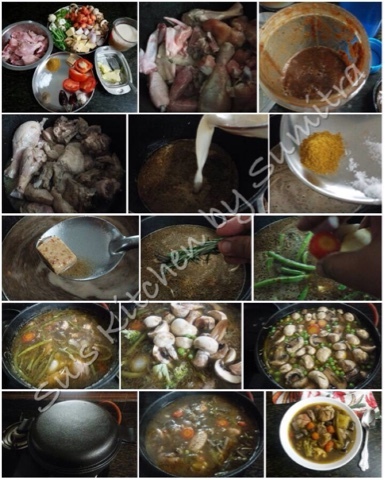 Add the mutton, stir and cook it for 3 to 4 minutes. Drain the dal and rice. Add it into the cooker. Stir and cook for 5 minutes. Add the salt and dry spice powder. Stir and cook for a minute. Add 3 cups of water. Close the lid and give 4 whistles. Once the pressure releases then open the lid. Stir it. Add 1/2 cup of water and ghee. Stir and serve hot. This is a fishy delicacy from Bengal. 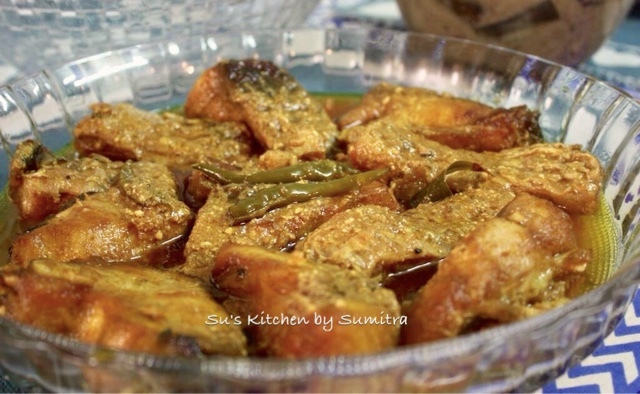 This dish is prepared during occasions. It's a bit sweet and sour in taste. Spiciness is adjusted as per requirement. 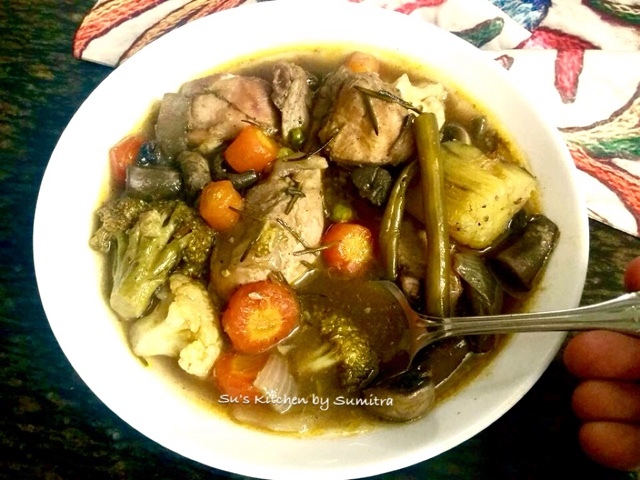 This dish is served with hot steamed plain rice or polau. 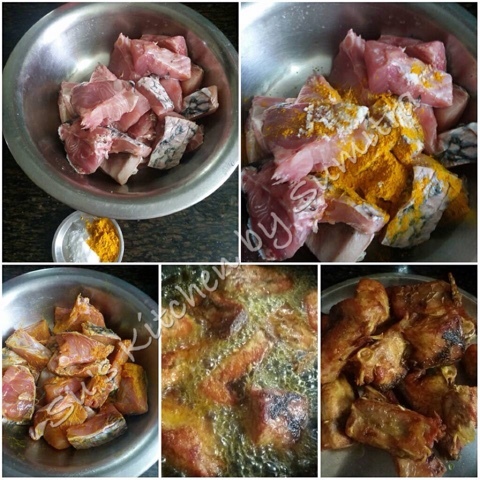 Marinate the fish with salt and turmeric powder and let it stand for 15 minutes.Heat mustard oil in a wok till smoking point. Reduce the heat and fry the fish till light brown in colour from both the sides. Remove the fish and keep it aside while the gravy is prepared. Take the same wok in which the fish was fried. Reduce the oil to 4 tbsp. Heat the oil. Add cloves, cinnamon, green cardamom. Let the spices crackle. Add the bay leaves and green chillies. Sauté it for few seconds. Add the onion paste, ginger paste, garlic paste and chilli paste. Sauté it for 3 to 4 minutes till the rawness of paste is gone. 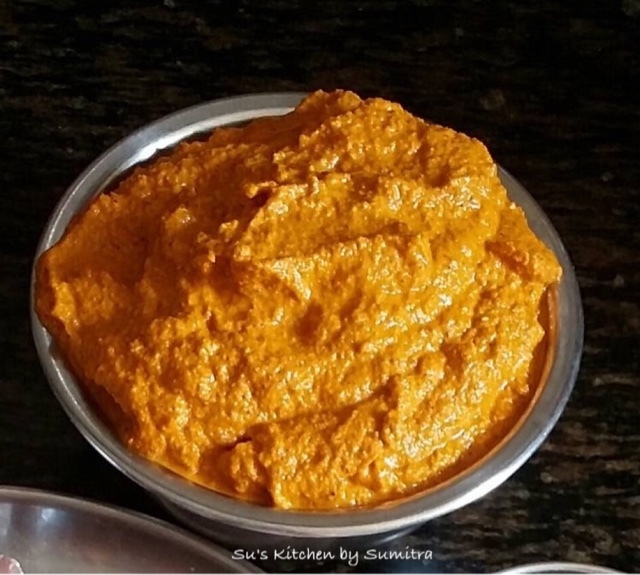 Meanwhile add the turmeric powder, cumin powder, coriander powder, chilli powder, garam masala powder, sugar and salt in the curd and beat it. Add the beaten curd into the wok. Sauté it for another 3 minutes. 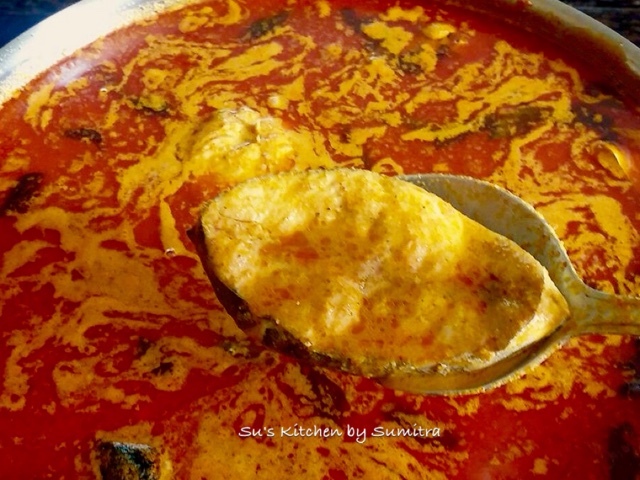 Add the fried fish into the curd gravy. Let it simmer for a minute. Add a cup of water. Cover and let it simmer for 15 minutes. Garnish it with coriander leaves before serving. Malvan is a town in Sindhudurg District, it lies in the southern most district of Maharashtra. Since it is on the coastal belt, the main occupation is fishing. It has its own style of cooking. 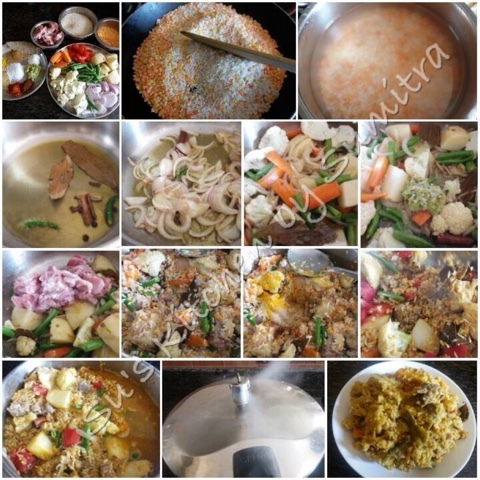 The staple diet of the local people is fish curry and rice. Coconut is used in abundant in various forms as grated, dry grated,fried, coconut paste and coconut milk. Some of the spices like dried red chillies, coriander seeds, peppercorns, cumin, cardamom, ginger, garlic, etc. are used in the paste. Kokum, dried kokam,tamarind, and raw mango are used to give a sour flavour to the curry. Malvani masala powder is made with 15 to 16 types of dry spices. This masala is grounded into powder and stored in jars to be used when required. Take a pan, add oil. Heat the oil. Add the 1/2 tsp Pepper Corn, Cinnamon stick, Cloves, Green Cardomom, Cumin seeds, Mustard seeds, Star Anise and Fennel seeds. Sauté it till it crackles. Add the garlic. Sauté till it lightly changes its colour. Add the onions, sauté it till light pink in colour. Add the chilies, sauté it for a minute. Add the poppy seeds and sauté it for another minute. Add the coconut and sauté it till it light golden in colour. Switch the flame off. Cool it. Add the ingredients in the grinder, add water and grind it. Open the grinder lid and add salt and turmeric powder. Grind it further to a smooth paste. Take a flat base pot or pan. Add oil, let it heat. Add the mustard seeds and star anise. Let it crackle. Add the garlic, green chillies and curry leaves. Sauté it for a minute. Add the wet paste. Sauté and cook it till the oil starts to separate out from the paste. 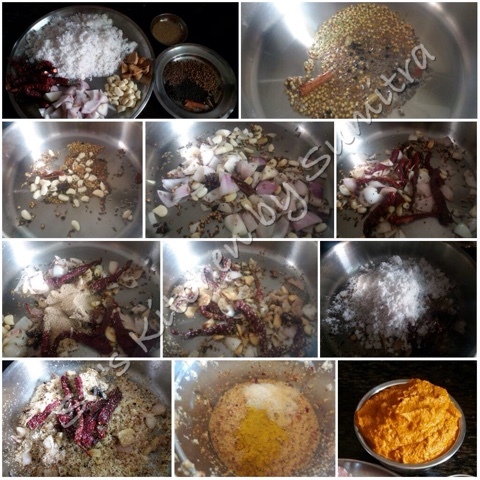 Add the salt and Malvani masala. Stir and cook for another minute. Add 1 liter water. Let it simmer for 10 minutes. Add the Kokam and let it simmer for another minute. Add the fish pieces and let it cook for 10 minutes or till the fish is cooked. Switch of the flame and garnish with chopped coriander leaves. 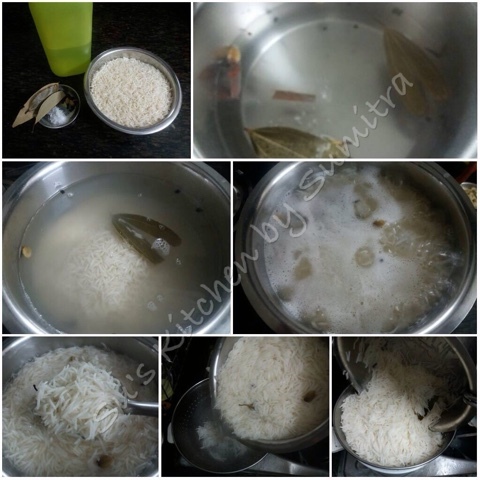 Serve with hot steaming rice. Papad ka Paratha is an unique dish sold in Gali Paranthe Wali or Paranthe Wali Gali, a narrow street in Chandi Chowk of Purani Delhi; where different types of Parathas are sold. 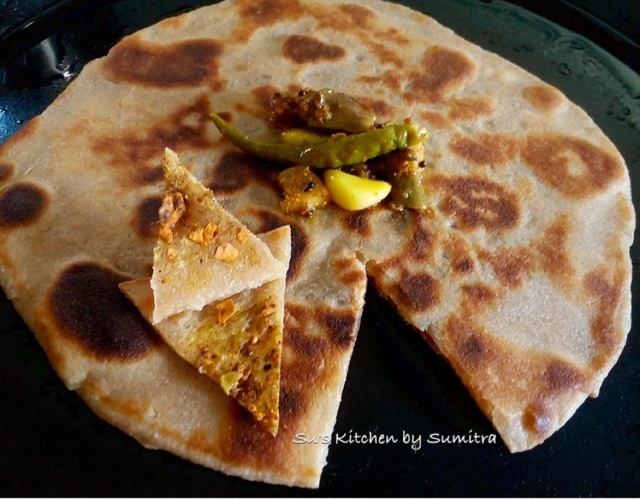 This paratha is made with Urid dal papad. The papad is fried and crushed and stuffed into a dough and then it rolled out into a disc and deep fried. I had some green garlic leaves growing in a pot. I ground the garlic leaves and used it in the stuffing along with the roasted crushed chilli papad and some more fresh garlic. This gives a garlicy flavour to the dish. Take a mixing bowl , crush the roasted papad. Add rest of the above ingredients and mix it well. Take a big lemon size portion of the dough. Roll it into a ball. With the help of your fingers and thumb; make a deep hole in the centre. Add 2 tsp of the stuffing in the centre. Close the edges of the dough. Press the dough. 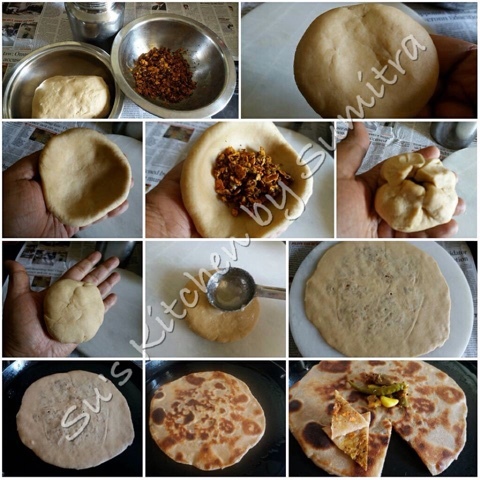 Apply little ghee on the dough and roll it out in to a round disc. Heat a skillet. Place the disc on the skillet. Cook the paratha by pressing it. Pour 1 tbsp of ghee and cook it for a minute. Turn the paratha. 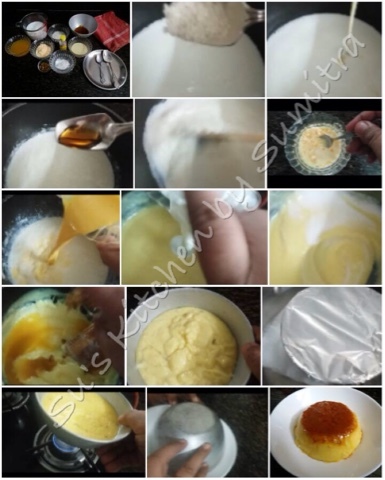 Add another tbsp of ghee and cook it till golden bubbles appear on both the sides. Remove and serve it hot. Break an egg in a mixing bowl. Add salt, chopped onion and green chilli. Beat it well. Take a skillet. Add 2 tbsp melted butter or ghee. Let it heat up. Lower the flame. Pour and spread the beaten egg. Place 2 pieces of bread on the Omelette. Let it cook for few seconds. 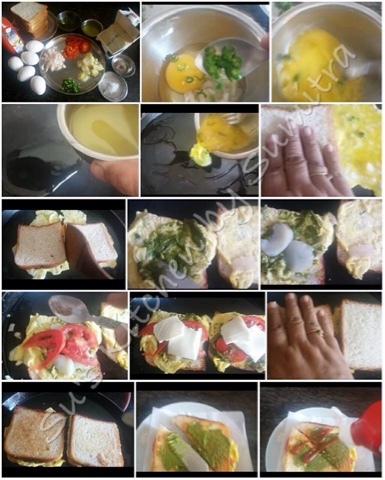 Cut the Omelette from the centre and turn the bread. The Omelette will be facing upwards. 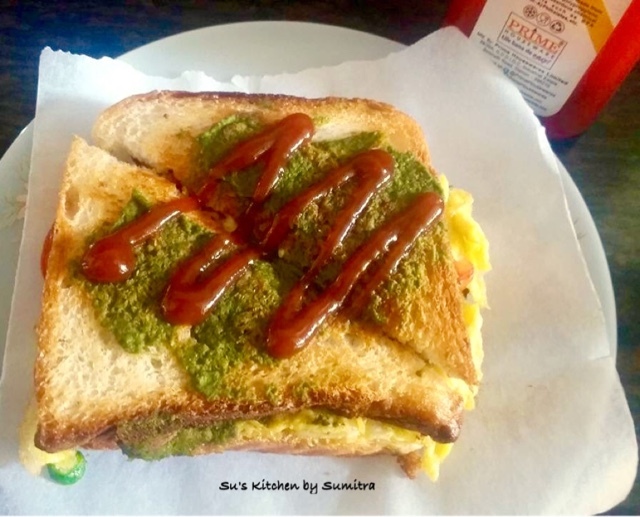 Apply green chutney on both the Omelette pieces. Place the potato slices and then the tomato slices on the chutney. Sprinkle some sandwich masala powder. Cut the sliced cheese into 4 parts. Place the cheese slices on the tomato slices. Take 2 pieces of bread and cover the sandwich. Press and toast the bread. Sprinkle some more butter or ghee on the bread. Turn the bread and toast it till it is brown on both the sides. Remove it from the skillet and cut it into triangle. Spread some more chutney and drizzle with tomato ketchup. Serve it hot. 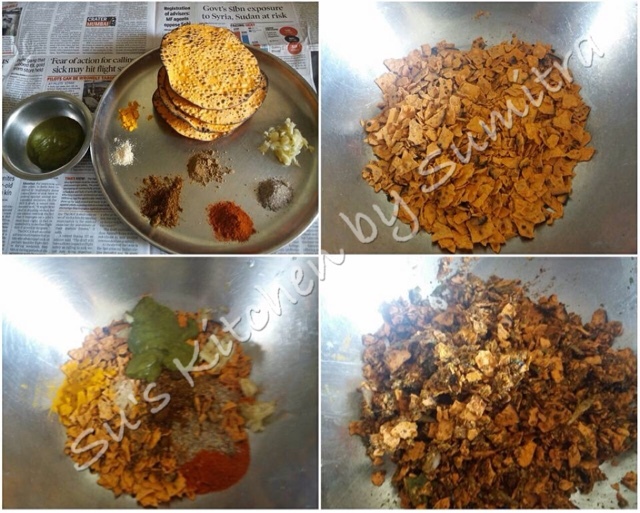 Roast the above ingredients except Rock Salt, Black Salt and Dried Mango powder. Let the spices cool down. Add all the ingredients in a grinder and grind it in to a powder. 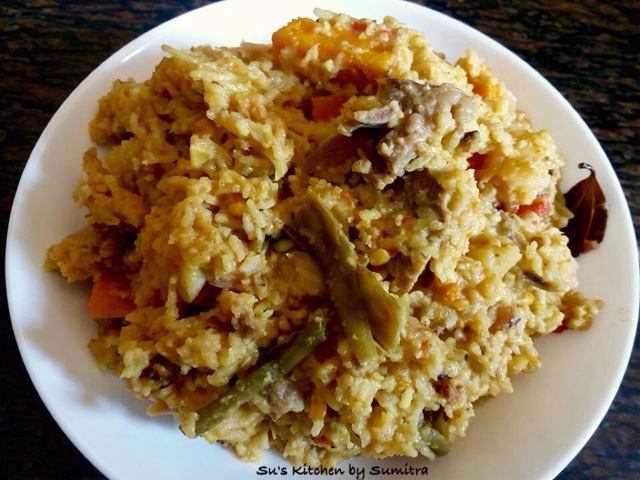 This Biriyani is very simple to make with all the ingredients easily available at home. 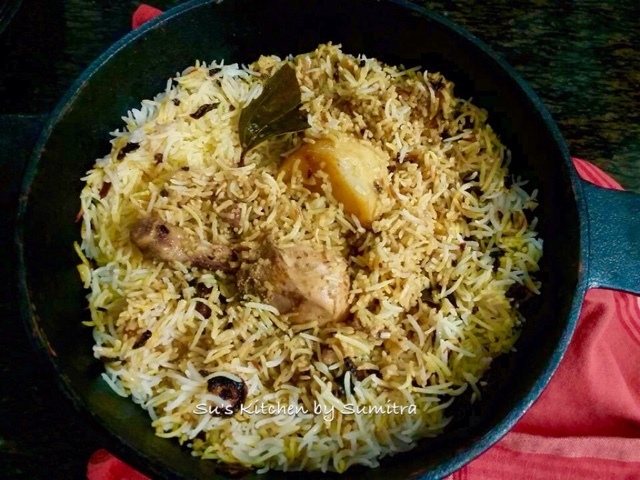 It is cooked in a cast iron pot with marinated chicken and half cooked rice. The chicken is infused with smoky flavour by burning a charcoal piece and placing it over the chicken and covering the lid. 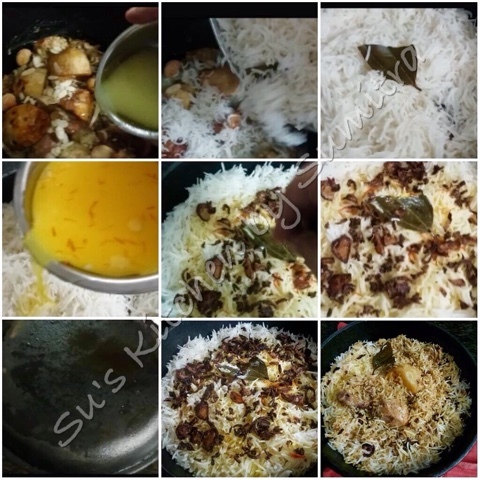 Once the biriyani is made, cover the pot and let it stand for an hour before serving. Serve it with raita. 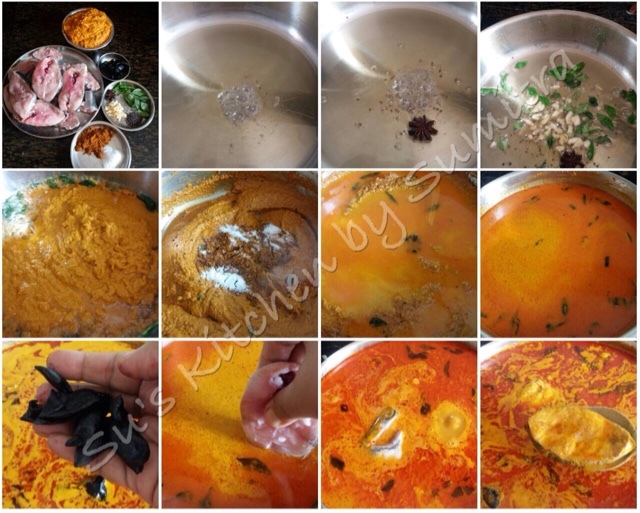 Add all the above ingredients in a mixing bowl and mix all the ingredients together. Keep it aside atleast for 2 hours or more. Take a deep bottom pot. Add half liter of water let it simmer. Add salt, cloves, cinnamon , cardamom and bay leaves. Let it simmer for a minute. Add the rice and let it cook till it is 50 % done. Drain out the excess water. Take a cast iron pot. Add the marinated chicken. Lay the fried potatoes and apricot over the marinated chicken. Sprinkle almond flakes and raisins. Take a bowl. Add milk, hot water, half of the ghee, remaining saffron water and kewda essence. Keep it aside. Smoke the charcoal piece. Put it on a small plate. Place the plate over the chicken and add a tsp of ghee. Quickly cover the pot for 2 minutes. Remove the cover. Remove the charcoal plate. Drizzle the remaining ghee over the chicken. Spread the rice over the chicken. Pour the milk over the rice. Garnish with fried onions. Cover the pot. Place the pot on a low flame. Cook it for 45 minutes to an hour. Check if the chicken is cooked. Let it stand for an hour before serving. Serve it hot with raita. P. S. If you don't have cast iron pot then use normal pots. The cooking is done evenly and the bottom does not burn in the cast iron pot.